The C9 NAMUR is the newest addition to the Versa NAMUR line of valves. The C9 is a ½” NPT ported NAMUR configured valve designed to provide higher flow to larger rack and pinion actuators. This solenoid pilot operated valve is available as single or double solenoid 2-position or 3-position valve. A complete selection of electrical connections, area classifications, and power requirements makes the most exacting and demanding specifications easy to satisfy. The C9 NAMUR valve is available as either 4-way (for double acting actuators) or 3-way (for spring return or failsafe actuators). Additionally, this valve is field convertible, requiring no special tools, gaskets, or sealants. Relocation of a port plate converts a 3-way to a 4-way, or a 4-way to a 3-way. 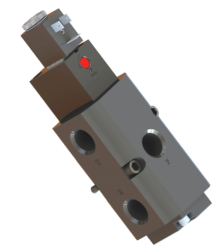 When the 4-way valve is converted to 3-way function, an internal drilling provides a ReBreather function to prevent contaminants from entering the actuator. The ReBreather function is used on single acting actuators to utilize air from the exhaust cycle of the piston side to fill the spring side of actuator. This prevents corrosive external atmosphere from entering the spring side. Single solenoid models (for 2-position control) or double solenoid models (for 2 or 3-position control) are available. Actuator positioning is possible with the use of 3-position valves since all Versa C9 NAMUR valves are bubble tight. Coil/solenoid housing per solenoid option selected. Mounting: Direct Mounting on NAMUR interface.